← CAVAN HOGUE. Brazil – somebody down there loves Donald. Climate change. Global warming. A hotter planet. A hotter Australia. Yet few are asking the difficult question of ‘how hot is too hot?’. We have so many elephants in the room at present that ‘the room’ is getting pretty crowded, but as we are barrelling towards 1.5oC of planetary warming since pre-industrial times, the ‘how hot is too hot’ elephant is definitely ‘in the room’. We need to let it out and examine heat tolerance. The world’s climate is on a wild ride: as another Polar Vortex delivered intolerable freezing cold to the USA, Australia faces climate mayhem. Over a metre of rain has been dumped on Townsville, while Tasmania and Victoria burn, and the nation has just experienced it hottest December on record. It is timely to ask how hot is too hot. After an apparent warming hiatus, global temperatures have risen sharply, with 2015 to 2018 being the hottest years on record. The average global temperature for the past five years, 2014-2018, was 1.04 ± 0.09°C above pre-industrial levels. Last year was Scandinavia’s driest and warmest, receiving half the previous lowest record of rainfall with observations back to 1748. This culminated in a prolonged heatwave north of the Arctic Circle, and record long runs of warm temperatures, including 25 consecutive days above 25 °C in Finland and 8 consecutive days above 30 °C in Estonia. In July, 11 fires burned concurrently within the Arctic Circle from Sweden to Alaska. That just shouldn’t happen! For ecosystems and infrastructure that are exquisitely adapted to or designed for cold weather heat extremes are hugely disruptive. Yet for Australia, further warming is even riskier as we are already a hot nation. Australia’s average daily temperature is 13.7oC warmer than the global average of 8.1oC. And Australia is getting hotter, with newly observed hot-to-cold temperature records now at a ratio of 12:1. Australia’s summer of 2018-19 has been exceptionally hot. Starting in November 2018, the heat extended with Australia’s warmest December on record, and continued through January, affecting every State and Territory. The delayed onset of the monsoons over the Pilbara and Kimberley occurred when the sun was directly overhead (summer solstice), providing maximum solar radiation and extreme heat. This heat tracked south-east across the continent, bringing Adelaide its hottest day on record of 46.5oC, a new record of four consecutive days over 40 degrees in Canberra, and a series of sweltering heat records across NSW, South Australia, Victoria and into Tasmania. So why is heat so problematic for humans? Primarily, because we are warm-blooded. We generate our own heat. Humans are, by-and-large, content to set their air-conditioning to about 22 or 23oC if sitting at a computer. This keeps our core temperature at about 37 degrees, meaning we generate that additional 15oC even when sitting still. Intense physical activity can increase that heat generation ten-fold. To stop ourselves overheating, our exquisite thermoregulatory system ramps into action. And when we are acclimatized to heat this ramp up is quicker and more effective. In hot conditions, we largely thermoregulate (cool) through the evaporation of sweat from our skin. Highly humid air is saturated with water, so the rate of absorption from our skin is slower, and our core temperature can rise. A breeze or fan moves away the boundary layer of air in direct contact with the skin, allowing in fresh, non-saturated air, and thus speeds up the heat exchange. We feel it as refreshing. So in the heat, the sweat rate increases and superficial blood vessels open up to put hot blood near the surface. But this opening of vessels lowers our blood pressure, so the heart needs to pump faster and harder to maintain a safe BP. Cardiovascular fitness determines how much extra work the heart can perform safely, before reaching maximum, or ultimately failing. Dehydration exacerbates the stress on the heart as it strives to keep a stable BP. Brain and kidney function diminish without good blood flow, so confusion can set in, and kidney failure can occur. Further compounding the problem is the loss of electrolytes, as sweat is not purely water. Electrolyte imbalances can interrupt conduction of the electrical impulses which make the heart beat in rhythm. This is seriously not helpful at a critical time, when the heart is working hard, and can precipitate a heart attack. There comes a point when our cooling mechanisms can no longer keep our core temperature about 37oC. As our temperature climbs an increasingly dire cascade of symptoms occurs, and death is increasingly likely the longer core temperature stays above 40 to 42 degrees. Hence, preventive measures advocate avoidance of heat exposure, and that resting is good as it lowers heat generation. Hydration is critically important, and fans offer relief. Acclimatization to the heat works on many levels, including increasing sweat rates whilst withholding those precious electrolytes, plus a host of changes at the micro level. Yet this takes time to build up and erodes without constant heat exposure. So people can be tricked into thinking they can function physically in heat based on past experience. Extreme heat at the beginning of the season is more dangerous, and many factors can diminish heat tolerance. So there is an upper limit to human heat tolerance, and climate change is pushing us closer to that limit. Furthermore, Australia is ahead of the curve. With only 1oC of warming to date, climate change is bringing more days over 40oC, and many Australian cities and regions are now seeing days well over 45oC, sometimes occurring in sequence. We don’t know when Australia’s major population centres of Melbourne, Adelaide, Perth or the western suburbs of Sydney will reach 50oC, but we DO KNOW that it will be sooner than we once thought, and it will not be pleasant. Being outside can easily become lethal, with risks made worse by even moderate exercise, such as walking. 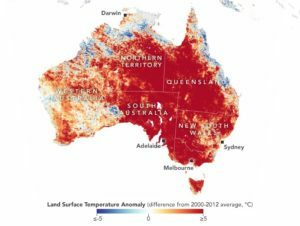 As the most lethal natural disaster, heat extremes represent Australia’s greatest climate-related health burden. Alarmingly, we are seeing a five-fold increase in heat extremes despite relatively small increases in mean temperatures. An intelligent species would take note of the proverbial canaries in the coal mine, and heed the warnings re the threat to our survival. The animal kingdom is providing us staggering examples of species decline due their inability to cope with hotter temperatures. White lemuroid ringtail possums were once seen at elevations of 600 metres in Far North Queensland’s Wet Tropics. Twelve years ago, they disappeared from there, but could be found at 700 metres, now a few can only be found above 800 metres, and basically, it’s the same with the birds. Fruit bats are dying in their hundreds during these increasing heatwaves. And about 40 brumbies died near Alice Springs in the January heatwave. Southern Australia’s hot dry heat extremes isn’t our only problem. The climate in Australia’s tropical north already dissuades many people from living there. The region’s high humidity reduces capacity to sustain safe core temperatures, especially when exercising, which limits human functionality. Warming across the tropical north has extended the number of months that many deem too uncomfortable to live, reducing safe levels of physical work to less than 30mins per hour for 5 months of the year in coastal regions. And all this is at only 1 degree of warming. Roll forward another degree, or more, and we find the risk increases exponentially. As a civil society, Australia must seriously consider how we propose to continue operating in increased heat extremes. We cannot expect people to risk their lives by working in unsafe heat. Following China’s model of paying extra “danger money” merely forces the poor to sacrifice years of life merely to support their families. A civil society would regard this as unconscionable. The sensible way forward is obvious. Task 1. Stop the warming. NOW. Task 2. Re-engineer our society to reduce heat risks. ADAPT. Liz Hanna researched climate change and human health at ANU for a decade, specialising in heat exposures. She convened the Climate Change Adaptation Research Network for Human Health, and was President of the Climate and Health Alliance for 6 years. Currently, she chairs the Environmental Health Working Group for the World Federation of Public Health Associations.